it’s a so called scarf, which has been lurking at the back of my mind ever since i first came across it. 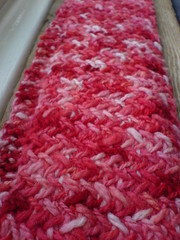 it turned out to be a fab watching the telly knit, nicely methodical but never quite boring. the yarn is around 8-9wpi, with a fair bit of variation, which happily worked well on the chunky 8mm inherited wooden needles that i’ve been itching to have a go with for ages. 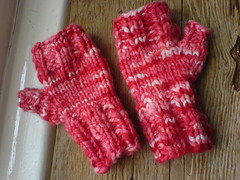 the stitch pattern works really well at obscuring the variegatity of the yarn. i didn’t quite manage the very short stretches of colour i was aiming for, as you can see on the mitts (stocking stitch, smaller needles) it’s giving around 3-4 stitches per stretch of the darker and lighter colours, set on a broader mid-pink background. i’m over the moon with the colours, lots of pinky variations, shot through with occasional flashes of the most fantastic intense blood red where the dye was most concentrated.